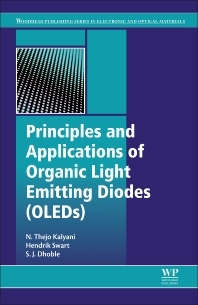 Principles and Applications of Organic Light Emitting Diodes (OLEDs)explores the ways in which the development of organic semiconductor materials is opening up new applications in electronic and optoelectronic luminescent devices. The book begins by covering the principles of luminescence and the luminescent properties of organic semiconductors. It then covers the development of luminescent materials for OLEDs, discussing the advantages and disadvantages of organic versus inorganic luminescent materials. The fabrication and characterization of OLEDs is also covered in detail, including information on, and comparisons of, vacuum deposition and solution techniques. Finally, applications of OLEDs are explored, including OLEDs in solid-state lighting, colored lighting, displays and potential future applications, such as ultra-thin and flexible technologies. This book is an excellent resource both for experts and newcomers to the field of organic optoelectronics and OLEDs. It is ideal for scientists working on optical devices, lighting, display and imaging technologies, and for all those engaged in research in photonics, luminescence and optical materials. Dr. N. Thejo Kalyani is an Assistant Professor in the Department of Applied Physics at Laxminarayan Institute of Technology, Nagpur, India. Her field of research interests include the synthesis and characterization of organic phosphors and fabrication of OLEDs. She has won a number of awards for her deliberations in various national and international conferences. She has authored 10 textbooks in the field of Applied Physics. She has more than 25 publications in international peer reviewed journals. She is lifetime member of professional bodies such as the Luminescence Society of India and the Material Research Society of India. Prof. Hendrik C Swart is a B1 NRF rated researcher (Internationally acclaimed researchers) and currently a senior professor in the Department of Physics at the University of the Free State. Over the past 22 years he has led research in the area of the degradation of phosphors for field emission displays, as well as developing materials for nano solid state lighting. He has been key in the development of processes to synthesize and deposit thin films of various types of semiconductor nano-particles which will enhance the colour, luminescent intensity and lifetime of such displays. He has more than 500 publications in international peer reviewed journals, 100 peer reviewed conference proceedings and is editor or author of 12 book chapters and books with more than 4700 cited author references and more than 530 national and international conference contributions (authored and co-authored). A research chair in Solid State Luminescent and Advanced Materials was awarded to him from the South African Research Chairs Initiative (SARChI) at the end of 2012 which was renewed for another 5 years at the end of 2017. The main focus of his research group is the improvement of luminescent materials for applications in Flat Panel Displays and Solar Cells; the development of Organic light Emitting Diodes (OLED) materials as well as materials for power-saving solid state lighting devices. He is an author two books Phosphate based Phosphor for SSL published by Springer and of Principles and Applications of OLEDs, published by Elsevier. Dr. Sanjay J. Dhoble is a professor in the Department of Physics at R.T.M. Nagpur University, Nagpur, India. Currently he is the Vice President of the Luminescence Society of India and he is on the editorial board of Luminescence: The Journal of Biological and Chemical Luminescence. His research is focused on the synthesis and characterization of solid state lighting materials as well as TLD materials for radiation dosimetry. He is also focused on the study of mechanoluminescence and lyoluminescence properties of oxide materials. He has published more than 570 research papers in international and national reviewed journals. His academic achievement includes best research paper awards for 33 research papers in conferences and he has served as a reviewer for 32 international and national journals. He has successfully guided 33 students for Ph.D. degrees. He is an author of two books: Phosphate based Phosphor for SSL, and of Principles and Applications of OLEDs.